The multi-page e-book tablet computers are coming; take a look at this overview of the models that are promised (or prototyped). 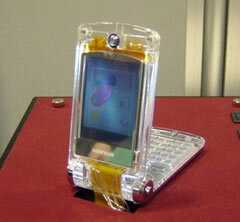 A two-page e-book reader has been prototyped by researchers at Maryland and Berkeley Universities. The basic idea is that users will be able to move to the next set of pages with a flipping motion that comes naturally to regular dead tree book readers. Read more about to see how this Two Page E-Book Makes Readers Flip . Toshiba must be wondering what all the fuss is over Microsoft's Courier. 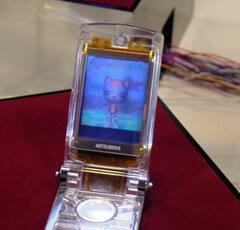 This dual-sided electronic book has all the same hardware, and this prototype was introduced six years ago. 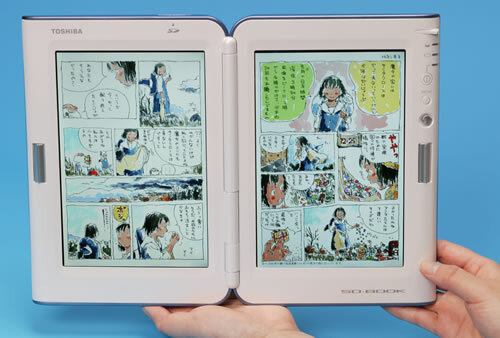 Read more about Toshiba's E-Book With Two Pages. Interesting new information has surfaced about Microsoft's Courier two-page ebook concept. Apparently, it actually exists as a prototype, for one thing. Take a look at this video to see how it works. It's been described as less than an inch thick, with a total weight of about one pound, and apparently runs on Tegra 2 and runs on the same OS as the Zune HD, Pink, and Windows Mobile 7 Series (WinCE 6). The rumored release date is Q3/Q4 of 2010, but we'll see. Okay, maybe this design is cheating just a bit, but it still has two distinct 'pages'. Mitsubishi has a prototype reversible LCD panel; a two-sided liquid crystal display that can show different images on each side. Read more about the Reversible LCD. 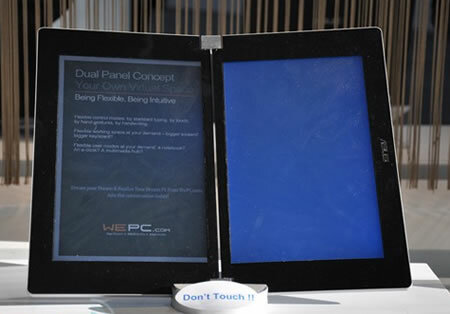 This dual panel touchscreen just surfaced at CeBIT in Hannover. It's a conceptual device, but the prototypes ran Windows 7. It's multi-page tablet style, with a little more processing horsepower than the average tablet. ...Runcible, whose pages [smart paper] were thicker and more densely packed with computational machinery, each sheet folded four times into a sixteen-page signature, thirty-two signatures brought together in a spine that, in addition to keeping the book from falling apart, functioned as an enormous switching system and database. Hopefully, readers will let me know what I've left out, so I can add them.